Do You Speak CALA ? TVC Caribbean and Latin America (CALA) is the region’s leading solutions provider, supplying products and full system integration services to the Broadband, Telecom, Utility and Fiber Optic Construction industries. Based in Miami with an additional stocking facility in Mexico City and personnel in Bogota, Colombia and the Dominican Republic; plus a new sales, service and support office in Sao Paulo, Brazil, TVC is uniquely positioned in the CALA market to supply both a vast product portfolio and full turnkey services. technologies to your customers, increasing your revenue stream. If your unique project isn’t neatly solved by an off-the-shelf product, TVC CALA’s sales team and highly experienced IP engineers will work with you to provide a personalized solution, including custom software development. Additional services include financing and payment solutions for equipment, technology and systems integration projects; logistical services; remote technical support, provided by multi-lingual call centers; full project management capabilities and operational support. To ensure your project continues to run smoothly after the launch, TVC provides full post sales and installation support, including product training, continuous monitoring and software upgrades. TVC CALA, the fully integrated product and service solutions provider to the Caribbean and Latin America. 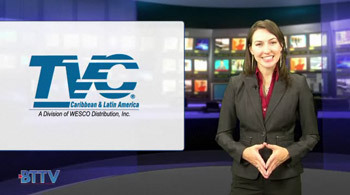 For more information, visit TVC CALA online at www.tvclatinamerica.com.